A stunning Christmas card, where the tree has been wrapped in a swathe of silver foil and topped with a silver foil star. The greeting reads 'Season's Greetings' and is printed with holographic silver foil. With this design you can add your family name or company name, printed in blue foil and curved as shown, to complement the design. Please note that the caption on this card cannot be changed on this personalised Christmas card. Card Finish: Holographic Silver foil. 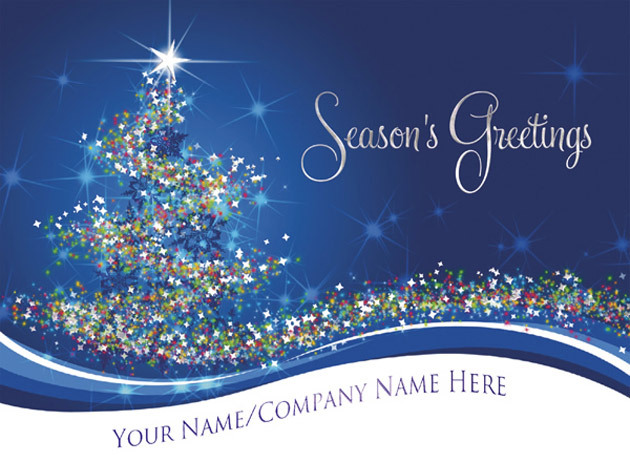 Add your name or company name in blue foil, curved at the foot of the card, as shown. By purchasing the Wrapped in Magic - Front Personalised Christmas card 10p for each card you purchase will be Donated to the Charity of your choice from the Charities listed below.